John was born in Sydmonton in 1887, the first child of Richard Peachey and his wife Julia Frances (née Greep). Richard, like his father before him, was a gamekeeper on the Sydmonton Court Estate (currently the home of Sir Andrew Lloyd-Webber). In 1906 Richard and Julia moved to Wash Common, then a rural part of Newbury, which was soon to see extensive development to the south of Essex Street. Street directories of the time do not list this road as Essex Street – just ‘Road west to Enborne’. R Peachy can be found occupying a cottage to the west end of this nascent street (now 57 Essex Street), running the Wash Common Dairy. It seems that Richard had ambitions beyond gamekeeping wanting to be his own boss. They rented the property, which included a long garden behind it - on which the houses forming the east side of Battle Road were built. A few years later, in 1912, the family moved again, to Corporation Farm on the other side of Wash Common, adding farming to the dairy business. John’s sights were set a bit further than his parents, in February 1911 he left Liverpool on the SS Hesperian, bound for Canada, returning in December on the SS Virginian. In 1913 he returned to Canada, this time travelling on the SS St Paul to New York. When war was declared in August 1914 many British immigrants in Canada signed up with the Canadian Army and fought on the Western Front with the Canadian Expeditionary Force. John did not follow this route, signing up instead with the Royal Berkshire Regiment. Thousands of young men like John signed up within weeks of war breaking out, so many that traditional infantry regiments like the Royal Berks were able to create new battalions (the Service Battalions which made up Kitchener’s Army). John served with the 8th (Service) Battalion arriving with them in France on 7 August 1915. The battalion joined the well established 1st Brigade in 1st Division, IV Corps. They replaced a Guards brigade, all of which were transferred at this time into a new Guards Division. Service with a battle hardened Division meant that it was not long before the battalion saw front line action. Shortly before leaving for France John took the opportunity to marry his sweetheart, Ellen Jane Chivers. Sadly the 8th Battalion’s numbers were severely diminished that day; at 10pm the CO, Col Walton was taken out of the lines for medical attention, leaving command of the battalion in the hands of 20-year-old 2nd Lt T B Lawrence. The battalion war diary entry for that day covers casualties in a terse phrase “Berks numbers were reduced to about half”. John did not answer the roll call that night and was reported as ‘missing’. In many ways this was the worst news for his family – while there was the hope that he was alive and a prisoner of war, the odds were that he was dead. Lce-Corpl John Peachey, 15619, D Coy, 8th Batt Royal Berks, reported missing September 25th, France. Any information gratefully received by his parents. Address: Mr R Peachey, Wash Common, Newbury. Mr and Mrs Peachey, of Wash Common, would be grateful to receive any information concerning their son, Lance-Corpl Wilfred John Peachey, who is reported missing since September 25th, the day of the British advance in France. It is, moreover, causing great anxiety to his young wife, to whom he was married just previous to going out with the 8th Batt Royal Berks in August last. Letters have been regularly received from him, together with a card just previous to the engagement. Mr and Mrs Peachey have another son, who has been in France for nine months without a break. He is in the Royal Army Medical Corps, and is at the General Hospital at Havre. Both of the foregoing were well known in local cricketing and football circles. Eventually the inevitable news arrived: John was assumed killed in action on 25 September 1915. As his body was never recovered in an identifiable form his name is recorded on the Loos Memorial to the missing (panel 93) at Dud Corner Cemetery just outside Loos. 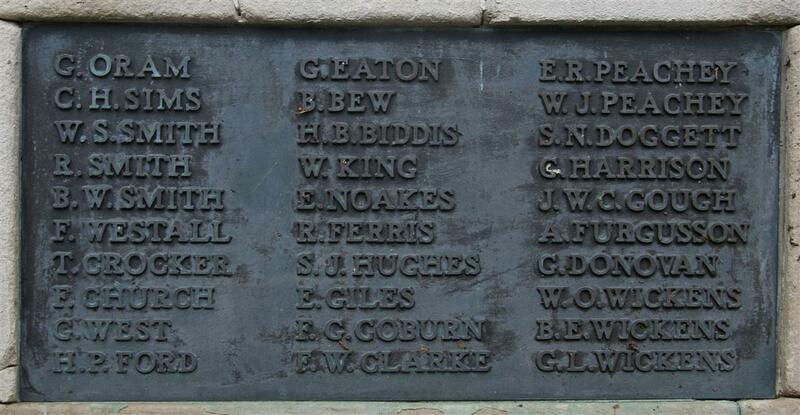 Locally his name is remembered on the Newbury Town War Memorial. Official news has been received that Pte Peachy, RAMC, has been recently wounded in the heavy fighting taking place on the Western Front, and is now in hospital at Birmingham. The wounded man, who is making satisfactory progress, is the youngest son of Mr and Mrs Peachey of Wash Common. Arthur survived the war and raised a family in the Newbury area, finally dying in 1981, aged 89. The third brother, Edward Richard Peachey served in the Royal Field Artillery and died of wounds in 1918. For his story click.